The promotional hoops you have to jump through at the beginning are annoying, too. Hitfilm Express takes aim at indie filmmakers with great tutorials and powerful features. Its unconventional interface could turn off true amateurs who just want to make a home movie, and it has an unappealing download procedure, but it’s still a great choice if you want to start making fun videos that mirror the sorts of effects and techniques you see in professional films and web series. The user interface is stylish and pleasant to use, but it does diverge from the standard consumer video editing software workflow in a couple of areas. If you’re not already accustomed to other software, this won’t bother you a bit, but it could be an adjustment for some. There are some features, like a zoomable preview window, a separate trimmer, and needlessly complicated and finicky exporting steps that seem more likely to trip up amateurs in entry-level consumer software. 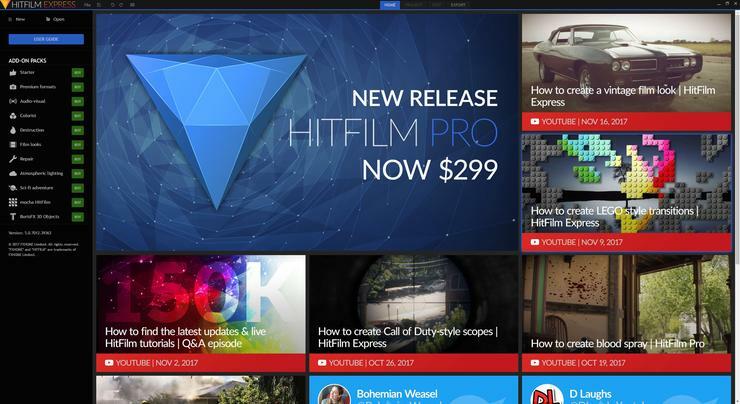 Rather, with a fun library of video tutorials oriented around various Hollywood movie tropes and genres, it’s clear Hitfilm Express is intended for upstart filmmakers. But it will do just fine for for YouTube gaming videos and other projects that are more advanced than just capturing and remembering your baby shower. YouTube exporting is supported, but only up to 30 fps, which will bother gaming YouTubers. That’s surprising, given that some of the tutorials are oriented toward gaming content. Here are two big caveats: To download the application, you must visit the Hitfilm website, scroll and click through some promotional materials, and then agree to connect your social media account and share a link to Hitfilm with your friends or followers. Only then can you provide your email address and have a download code mailed to you. Privacy hawks or people who carefully protect their social image will be disinclined to try this one out. The program also monetizes by selling you “add-on packs” that include looks, effects, and more; for example, the Sci-fi adventure add-on pack includes Star Wars-like lightsaber effects for $25. Hitfilm Express is laser focused on a specific audience; if you’re part of that audience, it’s nice to have something tailor made for you. But if web series, gaming videos, and amateur short films aren’t your objective, other free products will meet your needs better.